MOORESVILLE, N.C. (Feb. 20, 2017) – It’s no secret that Dalton Sargeant had a successful run in the ARCA Racing Series last year, capping off a 15-race season by earning the 2016 SCOTT Rookie of the Year award…and it looks like 2017 is starting off in the same fashion. The 18-year-old opened up the season with a 4th place run at Daytona International Speedway in the Lucas Oil Complete Engine Treatment 200 Driven by General Tire in his first race for Cunningham Motorsports (CMS). Sargeant had seen strong results throughout days leading up to the race, having the fifth fastest time in both practice sessions and then qualifying in the 10th position. Come race time, just like CMS teammate Shane Lee, Sargeant was able to stay at the front of the field for the duration of the 80-lap event, even leading a lap midway through. Within the first few laps of the race Sargeant found himself in the top five, but started to lose positions after a restart came from the first of many cautions. By lap 21, Sargeant was 11th and with the second caution of the night, the No. 77 car came in to pit for fuel only, coming out two more positions down for the restart. It didn’t take any time at all, though, for Sargeant to come back out on top and by just over the halfway point, he was up to second. With less than 30 laps to go, both Cunningham drivers found themselves one behind the other on the leader board, and stayed within one or two positions of each other, but never fully being able to work together to get to the top. Sargeant was holding on to fourth place until the race came under a red flag with five to go for a multi-car crash, which ultimately ended the night. Even though fourth place is not what the team was hoping for, Sargeant gained valuable experience and came out of his first Daytona race with more knowledge and positivity for the rest of the year. Now the attention turns from superspeedways to short tracks as the next race for CMS will be the Music City 200 at Fairgrounds Speedway Nashville in April. Until then, to stay up-to-date with all Cunningham news, follow along on social media through Facebook (@CunninghamRace), Twitter (@Cunningham_Race) and Instagram (@CunninghamRace). 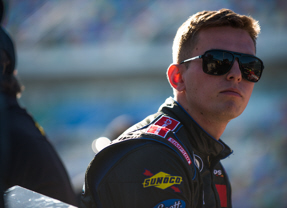 Be sure to also keep up with Dalton Sargeant by following his social media on Facebook (@DaltonSargeantRacing), Twitter (@DaltonSargeant) and Instagram (@DaltonSargeant).